Drinking pure water is a major necessity for a good mental as well as physical health. 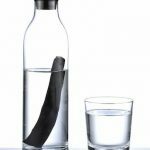 There are different ways in which you could purify water but what in the case of emergencies? Take, for example, a place is hit with a disaster and there’s a shortage of water. How will you arrange the water in such a situation? Will there be an ample amount of water for the survival of you and your family? It’s a fact that an average person could only survive for a maximum of 3 days without water. Therefore, you don’t have much time to think and act. What would you do in such a situation? The most basic method of all the ones listed here. If you have got a clean or fireproof vessel with you, then just pour in the water that is to be purified. First of all, you need to remove the large water impurities from it before you set it on the boil. You can use anything like the mesh-form thing, or simply a mesh for removing out the impurities. Then take the water, and set the water to boil on a stove or a solar stove or almost anything. 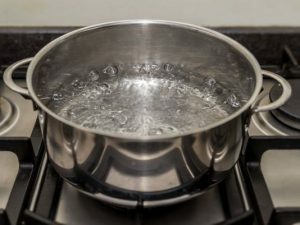 Don’t over-boil the water as this will simply waste a lot of water. Next interesting method for purifying the water is the Solar disinfection technique. There are many organizations putting in the efforts by teaching this method to the people living in an extremely bad condition. For this, you will only need the sun, one transparent PET plastic bottle, and an approx. of 6 hours of time. Most of the plastic bottles are made out of PET, you will find that name below any beverage bottle. Fill the bottle with water, and let it sit under the sun for 6 hours. The UV-radiations from the sun will pass through the bottle and this will kill the bacteria and other parasites present in the water. You can try the same method even in colder climates! Works out in all ways! It’s the method in which condensed form of the water, that is the purest form of the water is collected. This is the most effective method, especially if you have salt water as the source. You will simply need a clean cloth, stick tripod, and a pot. Fill the pot with water, and then tie up the cloth over the pot. This will collect the condensed water, and will eventually saturate the cloth. Squeeze out the water from the cloth, and set another dry cloth over it. That’s how you do it! The water that comes from the ground side is considered pure, isn’t it? This is because, the water after passing through rocks, sand, silt, and other natural elements gets purified. 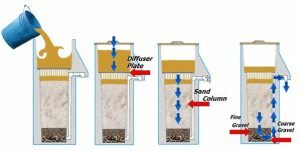 You can make a bio-sand thing at your home too, and use it for filtering water. To make it, you will need a tall container, a few hose pipes, and a variety of clean sand, gravel, silt etc. First, take the container, and then fill it with gravel and then a few inches of sand. Then, fill the container with very fine sand and silt. Before adding all these materials, make sure that there is boring done on the bottom side of the container. Your bio-sand filter is ready! If none of the above methods worked for you, then turn towards the chemicals! With the help of some of the common chemicals, you can purify water at your home. For example, charcoal is the best of all the chemicals for cleaning the water. It has an excellent absorption quality which takes out the sediments and impurities out of the water. You can also drain off the water, once the water is purified. 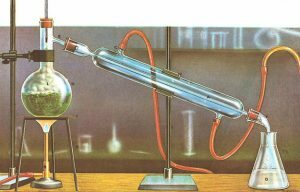 The other chemicals which you can use for the purification are chlorine, iodine, and even the calcium hypochlorite. You could keep this method as the final choice, in case you got no other way out for the purification. It is advisable to go chemical-free!